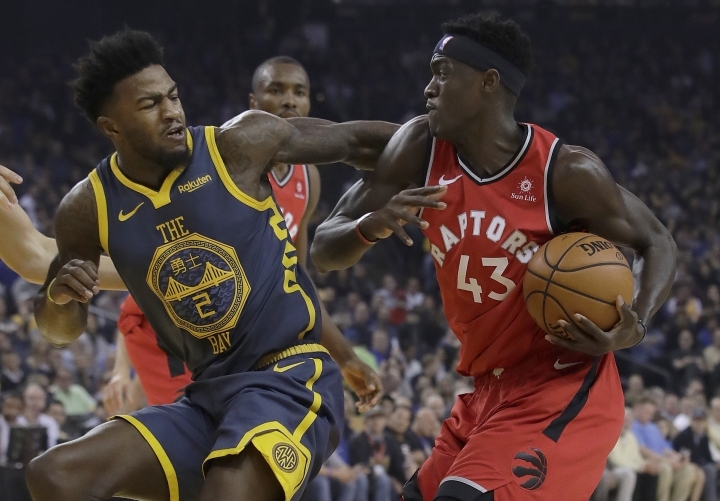 OAKLAND, Calif. — Kyle Lowry had 23 points and 12 assists to lead a balanced Toronto offense while leading scorer Kawhi Leonard sat out, Serge Ibaka added 20 points and the Raptors dominated Golden State from the start, beating the Warriors 113-93 on Wednesday night to complete a season sweep. Danny Green scored 15 points, Pascal Siakam had 13 and Fred VanVleet added 10 to help the Raptors improve to an NBA-best 23-7, matching the best start in franchise history. They did it despite not having Leonard for a second consecutive night. Toronto's star forward has a sore right hip and was ruled out less than 30 minutes before tip-off. WASHINGTON — Kyrie Irving scored Boston's last 12 points, including back-to-back 3-pointers in the final 40 seconds of overtime to outduel John Wall in a point-guard showdown, and the Celtics extended their winning streak to seven games. Irving finished with 38 points and seven assists. Marcus Morris added 27 points and nine rebounds for Boston, which played without Al Horford, Gordon Hayward and Jaylen Brown — its Nos. 4-6 leading scorers. Wall returned for the Wizards after missing a game with an aching left heel and finished with 34 points with 13 assists. But his seven points in OT weren't enough to keep pace with fellow All-Star Irving. Bradley Beal and Jeff Green each added 22 points and Kelly Oubre Jr. scored 20 for Washington. INDIANAPOLIS — Thaddeus Young had 25 points, 11 rebounds and four assists, and Myles Turner added 23 points to lead Indiana to its fifth straight win. Indiana pulled within a half-game of the Central Division-leading Bucks. Eric Bledsoe scored 26 points and Malcolm Brogdon finished with 15 to lead Milwaukee. Giannis Antetokounmpo had a season-low 12 points, grabbed 10 rebounds and dealt out seven assists after missing Monday's game at Cleveland with a sore neck. Indiana's Victor Oladipo wound up with 12 points, 10 rebounds and six assists after missing 11 games with a sore right knee. CLEVELAND — Jordan Clarkson scored 28 points and a basket by Rodney Hood in the fourth quarter gave Cleveland a late lead as the Cavaliers dealt New York its fifth straight loss. Enes Kanter and Tim Hardaway each scored 20 points for New York. CHARLOTTE, N.C. — Jeremy Lamb hit a 22-foot jumper from the right wing with 0.3 seconds left, and Charlotte Hornets rallied from a late 10-point deficit for a wild win. Lamb's buzzer-beater came with controversy. As he released the ball, Malik Monk ran off the Hornets' bench and onto the floor early to celebrate the made basket. Officials reviewed the play and called one-shot technical on the Hornets for having six men on the court. The basket counted. The Pistons made the technical free throw, but the ensuing inbounds pass was intercepted. Kemba Walker finished with 31 points, nine assists and eight rebounds for the Hornets, who won their third straight and moved into sixth place in the Eastern Conference — a half-game ahead of Detroit. PHILADELPHIA — Spencer Dinwiddie scored a career-high 39 points off the bench and Allen Crabbe had 20 to lead Brooklyn. Joe Harris had 14 points for Brooklyn, which notched its second victory over Philadelphia in three meetings. MEMPHIS, Tenn. — Mike Conley scored 23 points and keyed a fourth-quarter outburst as Memphis snapped a two-game losing streak. Jaren Jackson Jr. finished with 14 points, and MarShon Brooks added 13 for the Grizzlies. C.J. McCollum matched his season high with 40 points, while Damian Lillard was held to a season-low 14 points, connecting on only 4 of 18 shots. The Trail Blazers' 83 points were a season low. NEW ORLEANS — Anthony Davis had 44 points and 18 rebounds, and inconsistent New Orleans narrowly held on to defeat Oklahoma City. Jrue Holiday had 20 points and 10 assists, and Julius Randle added 22 for New Orleans, which has alternated wins and losses in its past 10 games. Paul George had 25 points and 11 rebounds, and Dennis Schroder scored 24 points for Oklahoma City, which came in having won five of its previous six. Russell Westbrook had 20 points and four steals but did not appear as eager as usual to shoot, hitting 8 of 16 shots. Steven Adams also scored 20. DALLAS — Harrison Barnes scored 25 points, Luka Doncic added 24 and Dallas extended its home winning streak to 11 games while ending a 10-game skid against Atlanta. J.J. Barea had 18 points before leaving with a sprained left ankle as the Mavericks finally beat the Hawks after blowing a 26-point lead in October. It was Dallas' first win over Atlanta since Oct. 30, 2013, and the home winning streak is the longest since a 12-game run in 2007-08. Trae Young had 24 points and 10 assists for the Hawks. SALT LAKE CITY — Donovan Mitchell scored 21 points and Derrick Favors had 17 as Utah romped over short-handed Miami. Rodney McGruder paced the Heat with 16 points and Kelly Olynyk had 14 as Miami played without Hassan Whiteside and Goran Dragic. Dwyane Wade, set to retire after the season, scored six points. Favors went 7 of 8 and had eight boards in 19 minutes, while Rudy Gobert had 10 points and 11 rebounds. Kyle Korver, who has opened up the floor for the Jazz since arriving via trade from Cleveland, made four more 3-pointers and scored 16 points. SACRAMENTO, Calif. — Nemanja Bjelica made four of Sacramento's 19 3-pointers and finished 25 points, helping beat Minnesota. Sacramento shot 58.1 percent (50 for 86) from the field in its fifth win in six games. Buddy Hield and Bogdan Bogdanovic each scored 20 points, and rookie Marvin Bagley III had 17 points and 10 rebounds.